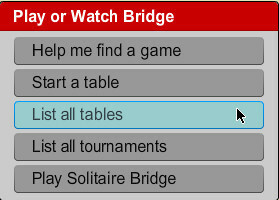 There are times when bridge players would like to watch a game rather than actually playing. Kibitzing on Bridge Base Online (BBO) offers a wide variety of tables where you can watch friends or even World Class teams play. So to watch a game, under the title Play or Watch Bridge, you can chose Help me find a game. And then under the heading Watch Bridge click the option to Take me to an interesting table. You will immediately join a table popular with other kibitzers. If you wish to choose an interesting table, click List interesting tables. You will be shown a list of interesting tables where kibitzers are welcome. Vugraphs, team games and main bridge club tables will be listed based on the number of kibitzers already attending. Many of these tables will have expert players in a match. You will be able to see that because of the "Star" on many of their profiles. Other tables will be those of your friends. 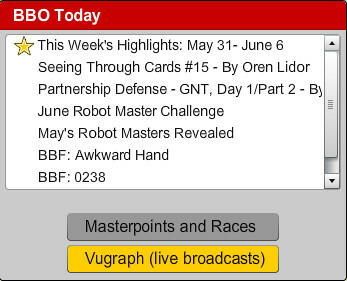 Look at the top of your opening screen under the heading BBO Now. A drop down menu will show you a description of any Vugraph currently running, as well as the option to review a list of interesting tables. But if you just want to see who is playing and find for yourself what you feel would be a fun table to watch, instead of clicking on BBO Now, click on the List all tables tab which you will find at the left of your screen. Once you have narrowed your table search to a specific place, you will now be shown a list of all tables in play in that area. As in all places on BBO, names of the table hosts are in alphabetical order. You can now scroll down this list of tables until you find one you'd like to kibitz. You can find out more about your chosen table by clicking on the More button. 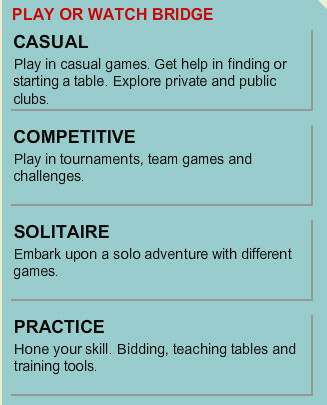 This will tell you what type of scoring is being used and whether or not permission is required to join to play. But since you are interested in watching only, you will want to focus on the Kibitzers column. If there is a Join button active, then that table is available to watch. If there is a slashed circle, then those players do not want kibitzers at their table.